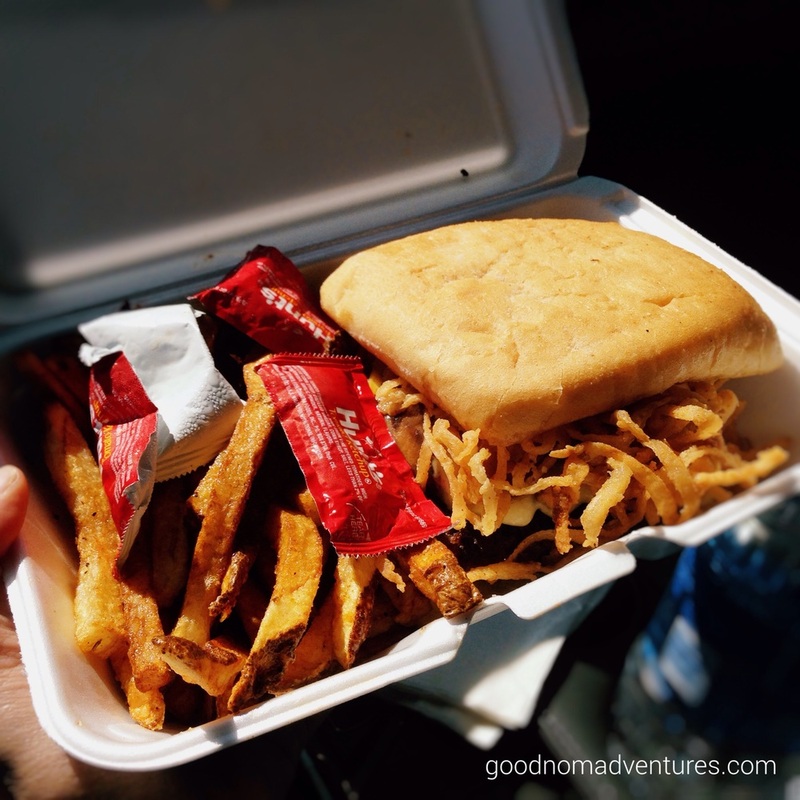 As soon as I found out I would driving through Roswell, New Mexico on my way to a scrapbook retreat with my girlfriends I knew I had to find a foodie adventure. How could I not? It's Roswell for Pete's sake...or should I say Todd's sake. 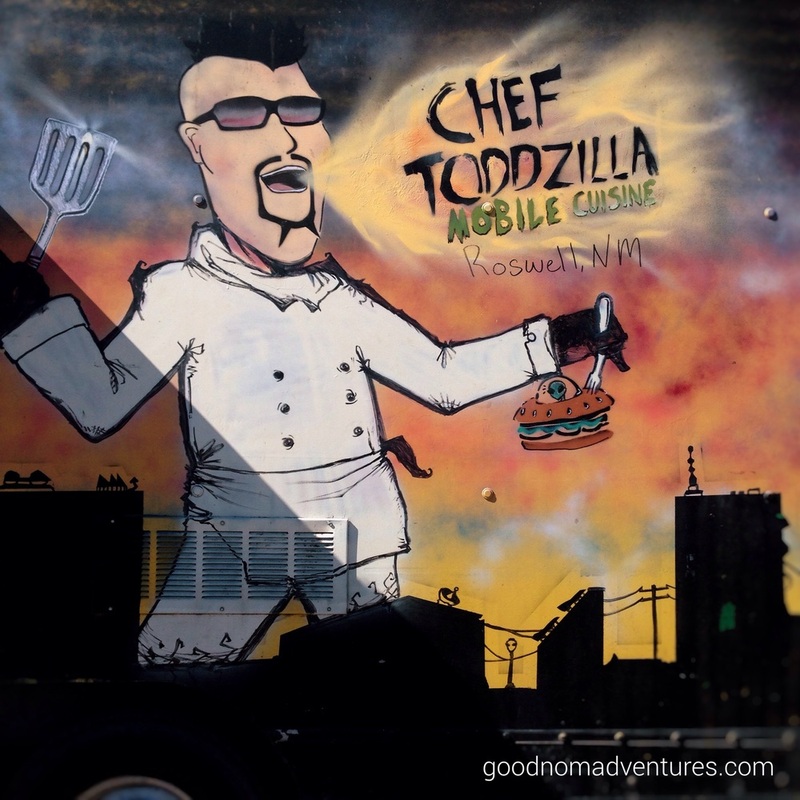 Chef Toddzilla's Mobile Cuisine stood out immediately as THE foodie destination in Roswell. They've been featured on Cooking Channel -- check them out Pizza Masters on Tuesday 3/8/16 at 10:30pm ET. 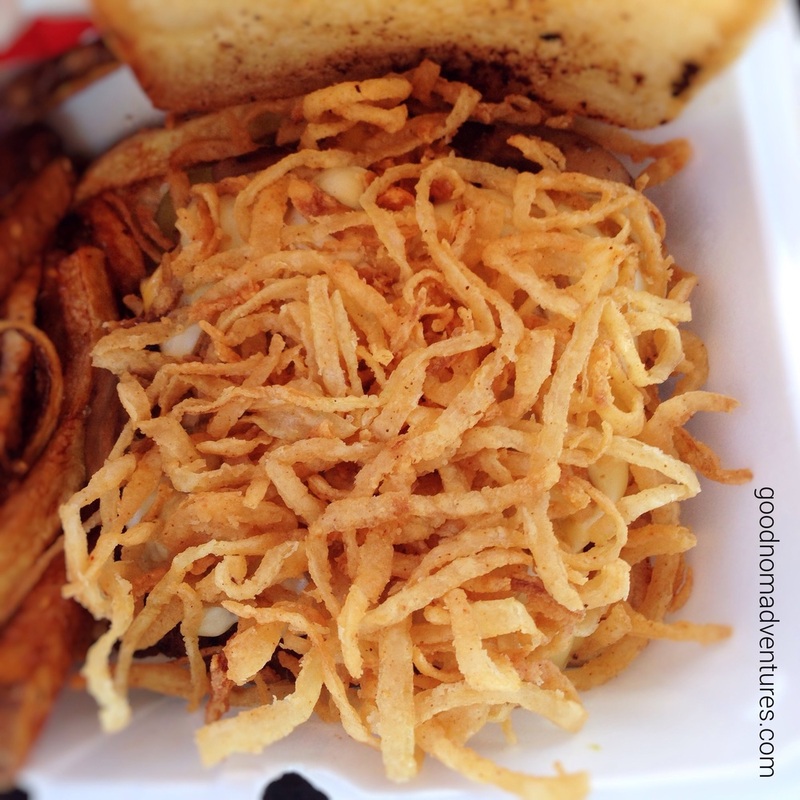 They serve up some of the tastiest burgers from their mobile food truck. An award winning burger food truck for 2016 mind you - congrats!! You must take advantage of any opportunity you have to try Chef Toddzilla if you're passing through Roswell. Follow them on Facebook for all the latest on their location. It truly was an adventure trying to find Chef Toddzilla. It's a mobile food truck so obviously they'll set up shop somewhere seemingly random. Turns out on my day of adventure they just happen to be just outside the Roswell International Air Center, which is used today as training grounds for today's naval fighter pilots and a boneyard for retired American Airline planes. It was sight to see rows upon rows of planes sitting in the vast expanse of the once operational Air Force base. Take quick peak at this Smithsonian video to check out the view from up top. The view from the ground was also not too shabby -- did I mention the fighter pilots? Chef Toddzilla was at 101 Southwest Drive when I came through town, which is the closest physical address to where they are actually located. If you get lost, like I did, twice, you can contact them on Facebook and they will respond almost immediately. I was able to get Kerry on the phone and she helped guide me in. I almost gave up trying to find them because I was just so lost. I even remember thinking to myself how lost could I possibly get within a less than 1 mile radius. They are just west of the Roswell campus of Eastern New Mexico University. If I were going to school there, I would definitely be hitting up Chef Toddzilla every chance I got. But they were so responsive and helpful and I heard nothing but great things about their burger. I knew I couldn't just give up and I'm definitely glad I didn't -- their burgers are to die for! They have 8 different burgers to choose from, which includes their famous Zilla Burger that's made with chili relleno. Since I'm not a fan of spicy things -- a shame, I know -- I opted for the mushroom burger. However, all their burgers are made the same and are all incredible in flavor. The burger patty itself was juicy and tender. It was absolutely the best burger I've ever had. Not only is it made with the freshest ground meat, but it also has bacon pieces mixed in. A burger with bacon! It can't really get any better than that. Except Chef Toddzilla also adds a bacon mayo along with these perfectly fried french's style onions except FRESH so it tastes out of this world awesome. The mushrooms were fresh and juicy as well. The cheese was ooey gooey and brought everything together. The burger also had the perfect bun-to-meat ratio. The fries were crispy yet tender at the same time, something that can be hard to achieve without over cooking it. Every bite was just so damn tasty! The best "weeds" I've ever tasted! Thank you Chef Todd and Kerry for welcoming to me your food truck! I literally couldn't have found it without your help and I'm so glad I did. Best burger ever! Congrats again on being named the 2016 Food Truck Burger Of The Year! If you want to find out what all the hubbub is about - and trust me you definitely want to - just check out where they will be coming soon and plan accordingly. You'll find them at various going-ons around the Roswell area, like the upcoming Art Faire or Burgers & Brews event at the Pecos Flavors Winery.